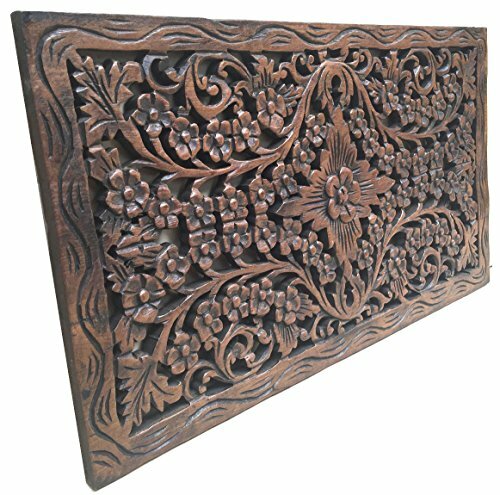 Wood carved floral wall art that will add beauty to any room. Made from teak wood. A product of Thailand that expresses a wonderful home decorative ambiance. Please note that you may see a slight difference in color as compared to that seen on your computer screen. Also, since most products are handmade and they are crafted from natural wood, there may be a slight size variation. Hand Carved Panel in Brown Finish, absolutely charming in any room of your home. If you have any questions about this product by Asiana Home Decor, contact us by completing and submitting the form below. If you are looking for a specif part number, please include it with your message.